Choosing a Dehumidifier that's right for you. Choosing a dehumidifier is not an easy task. If you are familiar with these appliances you may not need to read this page. If you know little or nothing about them you may well be confused by some of the terms used by retailers and even be misled by some of the sales copy you will read along the way. What I shall try to do here is to provide you with an overview of the things you may want to consider before choosing a dehumidifier. I believe that you are more likely to make the right choice if you know what you are looking for, the right questions to ask and how to make sense of the answers you are given. If you have questions about choosing a dehumidifier and this page does not provide an answer try our "FAQ's" (Frequently Asked Questions) page or ask me your question directly. You will see links to the "FAQ's" and "Ask a Question" pages at the top of the column on the right of this page. Somewhere in your world you have an enclosed space. It could be your home, or a room within your home, or perhaps a garage, basement or crawl space. It could be a storage place, such as a closet or a gun safe, or maybe a vehicle, your car, boat or recreational vehicle. If your search has brought you here you probably have a problem, or potential problem, with damp, condensation, excessive humidity or some other effect caused by them, such as black mold. If the problem is in your home you may find it helpful to take a look at our articles on damp and mold for information on their causes, consequences and cures. Choosing a dehumidifier may not always be the answer. What makes one model different from another? There are a number of different types of these appliances, not to mention dozens of differences between various makes and models. To make choosing a dehumidifier a little easier we are concentrating here on the essentials. When we talk about "types" this apparently simple term can be confusing. Dehumidifiers can be classified by how they work, which we shall call the "Process" and by where they are best suited to work, which we will describe as the "Application". A refrigerant model works in a similar way to a refrigerator. The refrigeration process is used to cool metal coils on which moisture from the air condenses. By constantly drawing the air across the coils its moisture content is reduced, thus lowering the relative humidity. A refrigerant dehumidifier consists of a compressor, condenser and evaporator coils for the refrigeration cycle and a fan to draw in moist air and expel drier air. Because it removes moisture by converting it from vapor to liquid it requires a water collection container (bucket) and/or a means of continuous drainage. The nature of their essential components makes the refrigerant type relatively large and heavy. The fan and, to a lesser extent the compressor, produce noise. Refrigerant models can be made more or less powerful by varying the size of the components and more powerful units are noisier than smaller ones. Refrigerant units are only fully effective at typical room temperatures and their performance declines dramatically in cooler conditions. This is the result of several factors but the most important is the formation of ice on the coils. This can occur at any temperature from about 65°F/18°C downward. Refrigerant models can be made to operate effectively at lower temperatures but require higher quality components and additional features to achieve this, making them more expensive. Manufacturers' claims for their products may sometimes lead to customers choosing a dehumidifier that is not capable of the effective low temperature operating capability they need. If you are choosing one for use in the living areas of your home a refrigerant model will be entirely suitable and is the most common type you will find offered for sale. This type absorbs water from the air using a desiccant. A desiccant is a material that traps water and will be familiar to anyone who has ever found a small pack of crystals, labelled "silica gel", packaged with a camera, computer or some other product. A wheel, or rotor, consisting largely of the desiccant turns slowly through the incoming air stream and absorbs moisture. During the rotation cycle a proportion of the wheel is passing through a stream of warm air which "reactivates" the desiccant by driving off the moisture. In some desiccant models for use in the home the water is collected or drained, as in the refrigerant type. In a commercial unit the moist air is discharged, via ducting, outside the building or to another area. This variety of dehumidifier tends to be smaller and lighter than the refrigerant type, especially if it vents moist air rather than collecting water. 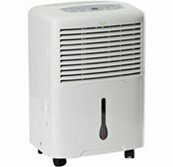 A desiccant unit is usually quieter also, a significant issue for many people when choosing a dehumidifier. A desiccant model can operate at much lower temperatures than the refrigerant type. It will also reduce humidity, both relative and specific, to much lower levels. Water extraction rates tend to be lower in desiccant models and energy costs higher. For these reasons the desiccant type is more usually found in industrial, commercial and government settings which are much more likely to require its special capabilities. Recent developments have allowed desiccant technology to be applied to domestic applications and these new technologies have made these devices more affordable to buy and to run. If you are choosing a dehumidifier for a particularly cool area, such as some garages and workshops, or considering a whole house dehumidifier, you may wish to take a look at one of the desiccant models which are now available. The Peltier process exploits the principle that an electric current passed through two different, layered materials creates a heat-flux at the junction between them and transfers heat from one side of the joined materials to the other. This phenomenon allows low capacity heaters and coolers to be constructed without moving parts. This technology is applied to dehumidifiers, which condense moisture on the cool side of the joined materials. It is quiet but is only suitable for small areas and is far less energy efficient than either conventional refrigerant or desiccant models. The primary applications are highly specialized and individual consumers are only likely to encounter Peltier technology in use for cooling, where it is sometimes used in portable coolers. Some Peltier dehumidifiers are offered by manufacturers for home use but their low capacity and higher energy cost make them unsuitable, except in rare cases, and cheaper alternatives are almost always available. If you are choosing a dehumidifier to deal with a high humidity problem in even the smallest of rooms a peltier unit is very unlikely to meet your needs. 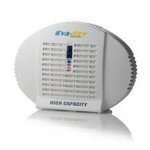 The Rechargeable type is a low capacity device that also relies on the water absorbing capacity of a desiccant. In essence it is simply a larger container of silica gel than the small packets mentioned earlier. The container makes it convenient and clean in use and the "reactivation" of the desiccant is achieved by connecting the unit to an electric supply outlet for a few hours every four to six weeks. This type is effective in a restricted space, such as a drawer, a closet or a car. A rechargeable unit will not be effective in a room, however small, or even a walk-in closet; the moisture removal capacity of this type is simply too small. Portable units for use in rooms remove pints, or litres, of water from the air every day, this type will only extract thimbles-full. If, on the other hand, you are choosing a dehumidifier for use inside your car one or two of the rechargeable type is the only practical solution. Technically the heat producing type, usually a heated rod, does not remove moisture from the air. Relative humidity is an expression of the percentage of moisture in the air, relative to the amount that could be "held" by that air, at a given temperature. Air will "hold" more water when it is warm than when it is cool. Relative humidity falls by a factor of approximately 2 for every increase in temperature of 20°F/10°C. So if relative humidity is 50% at a temperature of 50°F it will fall to 25% RH if the temperature rises to 70°F and the absolute amount of moisture, the specific humidity, remains constant. A heated rod placed in an enclosed space will raise the air temperature within that space and thereby reduce relative humidity. This is effective in protecting many items from moisture damage because the rod keeps the temperature well above the dew point, the point at which some of that moisture will condense. Heated rods are popular for use in safes and gun safes, particularly where these secure storage units are located in areas of low ambient temperature, because they protect the contents within these small spaces at a fraction of the cost of heating the whole room. Choosing a model of this type is a practical option for small, enclosed areas, isolated from the atmosphere of the larger room in which they are placed, if it is unsafe or inconvenient to leave them open. More information about how a dehumidifier works is available for those who would prefer a more detailed explanation of the five processes. It also considers some of the other features incorporated in these appliances which may be very important when choosing a dehumidifier. There are more applications for these appliances than can possibly be considered here. Industrial and commercial applications include production and storage areas, computer rooms, pumping stations, oil rigs, offices, hotels, stores, ice rinks, swimming pools and gymnasiums to name but a few. In the public sector libraries, museums and the armed forces are prominent examples and the water damage restoration sector is yet another major user. Here we will concentrate on the needs of the residential user, for their home, areas adjacent to their home and their vehicles. Industrial, commercial and other non-residential users often start with expert knowledge and their special needs are dealt with elsewhere on this site. Residential applications fall broadly into these categories. Portable models are almost invariably of the refrigerant type. They are stand-alone units which vary mainly in the size of room for which they are suitable. This is the type that can be easily bought in home improvement centres and department stores and carried home in the car. These units vary from brand to brand in quality of build, reliability and, of course, price. The better quality models tend to be offered at a higher price but the sad truth is none of them is built to last and that the cost of repair is so high in relation to the purchase price that when they fail it is more cost-effective to replace them. Warranties typically run for one year with additional years limited to the sealed refrigeration system. In the second and subsequent years the customer is usually responsible for all shipping costs arising from a return under warranty and may also have to bear the costs of diagnosing the problem and removal and reinstallation charges arising from the service. For a typical portable model with an original purchase price of say, $200-$300, these costs are very likely to make replacement more attractive than repair of a unit already at least one year old. The life-time cost of a portable unit is likely to be more than twice its purchase price with the major part of that cost being electricity. Bearing in mind its relatively short "life expectancy" it is arguable that the most important factor to consider when choosing a dehumidifier is its energy efficiency. A more detailed examination of how much these appliances cost expands on these points and may prove to be useful reading for anyone choosing a dehumidifier of this type. The majority of whole house models are also of the refrigerant variety although desiccant units for this purpose have been recently introduced. I shall confine my brief comments on this page to the refrigerant versions. A whole house dehumidifier is a very different animal from a portable model. Sales literature for some large capacity portables appears to claim that humidity throughout a whole house can be managed by such a unit but, except in a small home, more than one will normally be required. In order for an area separated by walls into a number of individual rooms to be covered by a single, stand-alone unit all the internal doors must be open and all windows, and all doors opening to the outside, must be closed. In addition air circulation will need to be assisted by fans for effective humidity control. A whole house model is located in one part of the house, maybe a basement or crawlspace, from where it reaches the rest of the house via ducting, ensuring uniform moisture control throughout the home. More often than not the whole house unit will be installed using the existing ducting for the Heating, Ventilation and Air Conditioning (HVAC) system but can be configured to operate through independent ducting. Whole house models are considerably more expensive than portable units. They are built to commercial standards and are generally more robust, durable and energy efficient. It is always the case that larger capacity models are more energy efficient than smaller units but these purpose designed appliances achieve greater economies than those due to size alone. For this reason a whole house unit with a water extraction capacity of, say 140 pints per day, will consume considerably less energy than two portables each of 70 pint capacity. When the lower performance, shorter working life and higher energy costs of portable models are taken into account the higher ticket price of a whole house unit looks more competitive. 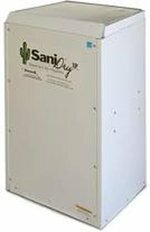 When the need for two or more portable units, plus fans, is factored in the inescapable conclusion is that choosing a dehumidifier built to control moisture throughout the whole house is the less expensive option or a home of any size. In addition to the question of cost a whole house unit is a more convenient and neater solution which can be sited where it is least intrusive, offending neither the eye nor the ear of the user. They require little maintenance and are drained continuously so there is no bucket to empty. They have effective low temperature operating capability so cold basements are not a problem. An in depth review to help with choosing a unit for the whole house can be found on our whole house dehumidifier page. 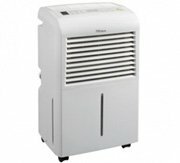 A basement dehumidifier is a unit designed for use in a basement. It is similar to whole house models in so far as its quality, durability and energy efficiency are concerned. It is fully capable of operating at low temperatures, which is essential in some areas where basement temperatures may be very low. A portable unit, provided it has sufficient capacity for the area of your basement, may be an acceptable option, provided certain conditions are met. The basement must be kept at a reasonable ambient temperature, at least 60°F/16°C, at most times. If high relative humidity is a problem a portable model will be effective but if exceptional dryness is required, for storage of sensitive items for example, choosing a dehumidifier designed for a basement would be preferable. In larger basements, even without partition walls, a good circulation of air is necessary for humidity control. A basement unit can be ducted to discharge dried air from one or more outlets at a distance from the unit to achieve this. If a portable model is preferred one or more fans will be needed to achieve air circulation, incurring more expense to buy and operate the fans and a higher noise level. In general terms a small to medium sized, finished basement, used in part or in full as an extension of the living area of the home will be adequately served by a large capacity portable. In most other circumstances a dedicated basement model will be a more effective and, in the longer term, a cheaper alternative. You will find more information on choosing a dehumidifier for a basement on our basement page. You may also find it useful to read our article about which are the best basement models. Crawl space dehumidifiers are exactly the same as those for basements except for one important difference. Crawl spaces are, by definition, areas in which there is room to crawl not to stand. A crawl space unit is designed to be compact and to be low in height to enable installation in a crawl space with restricted head-room. Crawl space models make excellent basement dehumidifiers because they have exactly the same capabilities but a basement unit is not necessarily a good choice for a crawl space because it is tall and thin, rather than short and squat. This very brief introduction to choosing a dehumidifier for a crawl space is more fully developed at our page about crawl space models. We have considered the home from top to bottom but many homes have additional spaces attached or adjacent to them where moisture control may be a problem. These include garages, workshops and other buildings used for storage which tend to share common characteristics. These annexes are frequently unheated and typically lack the insulation found in the main part of the home. They may be built from different materials which may be less resistant to heat transfer than the construction materials used in the home. Where climates are cool, for at least part of the year, the ambient temperature may fall dramatically lower than in a home and at lower temperatures there is a serious risk of condensation. These structures may contain cars and other vehicles, expensive tools, household and other goods, all of which may suffer moisture damage and some or all of which may be expensive to repair or replace. Choosing a dehumidifier for such an area is a little tricky since the low temperature operating conditions demand the qualities of a basement unit but the areas involved would make this is a ridiculously expensive option. There are, however a number of portable models which, while not as robust as a specialized basement unit have the low temperature operating capability which this type of space may require. These models include refrigerant and desiccant units and are described at a deeper level on the garage dehumidifier page. We have used "garage" as a convenient title to cover all annexes as the problems of humidity control they present are broadly similar. Within the home there are some small, enclosed spaces within which control of humidity is important in some circumstances and a compact unit of limited capacity is the ideal solution. Safes and gun safes for example are small and virtually air-tight. Because they contain high value items, confidential documents or potentially dangerous weapons these storage areas must remain locked at all times and will be unaffected by the relative humidity of the room in which they are located. They are, however, affected by the ambient temperature of that room which will conduct heat from the metal body of the safe when it falls, lowering the air temperature inside the safe and precipitating condensation. It is often far cheaper to place a rechargeable unit or a heated rod in the safe than to heat the area around it to protect these valuable items. Drawers and closets present different problems and come in a huge range of sizes, from tiny drawers for small items, such as jewellery to large walk-in closets. Choosing a dehumidifier of the right size for the job is not always easy so we have further detailed information and advice on a page devoted to this application. A highly specialised area of humidity control is for pianos. A piano needs a stable range of relative humidity both inside and outside the instrument. This can be complex enough to require a room dehumidifier and a room humidifier in the "music room" and a small device controlling humidity inside the piano. Finally, to ensure that some of you can hear the piano as well as possible and, of course, all other sounds, we discuss hearing aid dehumidifiers, the value of which is only appreciated by those who, like the author of this page, benefit from an aid in perfect working order. When we travel away from our homes we generally do so in a vehicle, usually a vehicle we own. Most commonly this is a car but many of us own a recreational vehicle and some of us live in the RV year round. Control of condensation and other RV maintenance issues should be considered at all times. A few of us may make most of our journeys by boat but many more own a boat for leisure use. Whether you are using a motorhome or boat, condensation induced RV problems can be easily avoided using a suitable portable unit.